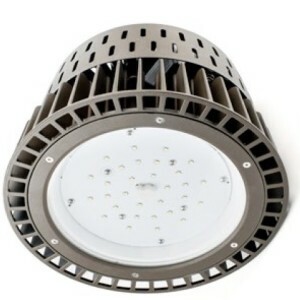 The High Performance LED High Bay and Low Bay delivers high lumen output, long life, dimming capabilities, and no restrike time. This energy-efficient LED luminaire offers one-to-one replacement of existing HID or fluorescent high bays. Quality manufactured die cast body integrated with high performance components enables long life and lower maintenance costs. APPLICATION Warehouse, manufacturing facilities, retail, gymnasiums, grocery. Rugged die-cast aluminum housing withstands environments without climate control. Outer surface treated with durable powder coating to provide resistance to corrosion, rust, weathering, and UV degradation. Performance-engineered, integral heat dissipation fins and LED thermal substrate provides superior thermal management for long life and reliability. Comes standard equipped with hook mounting. Various mounting options available: J-box, pendant. Various optical reflector systems available to adjust distribution.